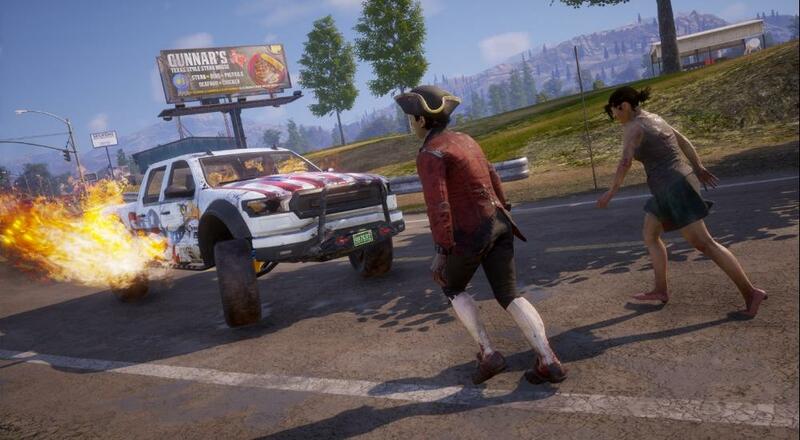 "Celebrate the independence of a nation by blowing up a small piece of it"
Undead Labs is getting into the 4th of July spirit a little early with the Independence Pack for State of Decay 2. The DLC is currently available for both the Xbox One and Windows 10 versions of the game and if, like me, you're into driving around in vehicles opening doors, then this pack adds to the excitement with the introduction of new cars like "The Meatwagon" and "The Burninator." The DLC costs $4.99 (or free if you got the Ultimate Edition of the game) and not only adds three new vehicles, but also three melee weapons (The Freedom Ringer, Grillmeister, and BBQ Fork), two ranged weapons (Pyro Launcher and Starshank Launcher), and some festive decoys that spray fireworks all over. Along with the DLC, Update 2.0 also dropped. Not only does it include a number of fixes/changes, but also adds 20 new missions, new weapons, a new trader, and some "Revolutionary War" zombies. This update is free for everyone regardless if you pick up the Independence Pack or not, so enjoy! Finally, the next planned DLC will arrive in September. The Daybreak Pack will include "all-new content lets you take the fight to the zombies, featuring an exciting new mode where you play as a well-equipped Red Talon soldier. You’ll work to complete a challenging objective while protecting your fortified position against waves of zombies and freaks to earn new rewards and weapons." No exact release date or price has been announced for that. State of Decay 2 is available on Xbox One and Windows 10 PC. Four player online co-op is supported throughout the campaign, though campaign progress is only tracked for the host player (other players that join do get some benefits as we detail in our Co-Op Review). Cross-platform play and cross-platform saves are supported thanks to Xbox Play Anywhere, and the game is available for free via the Xbox Game Pass program.